Published in Rafu Shimpo, October 9, 1968, Japanese section. 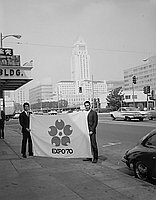 Two men hold the Expo '70 flag for the World Exposition to be held in Osaka Japan in 1970 on a sidewalk in Little Tokyo with Los Angeles City Hall in the background, Los Angeles, California. They are identified (left to right): Shoji Kimura and Jinichiro Nakamura. 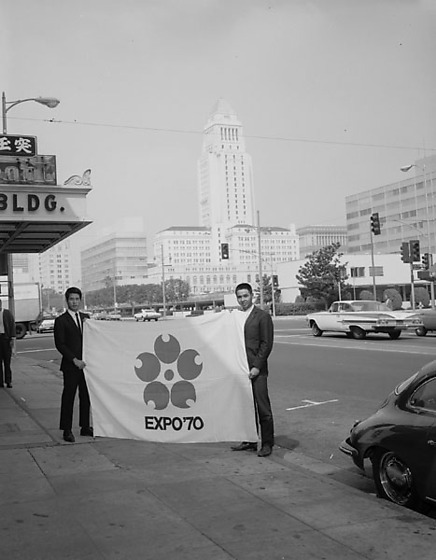 Typed on original envelope: Expo '70 -- 2 people.